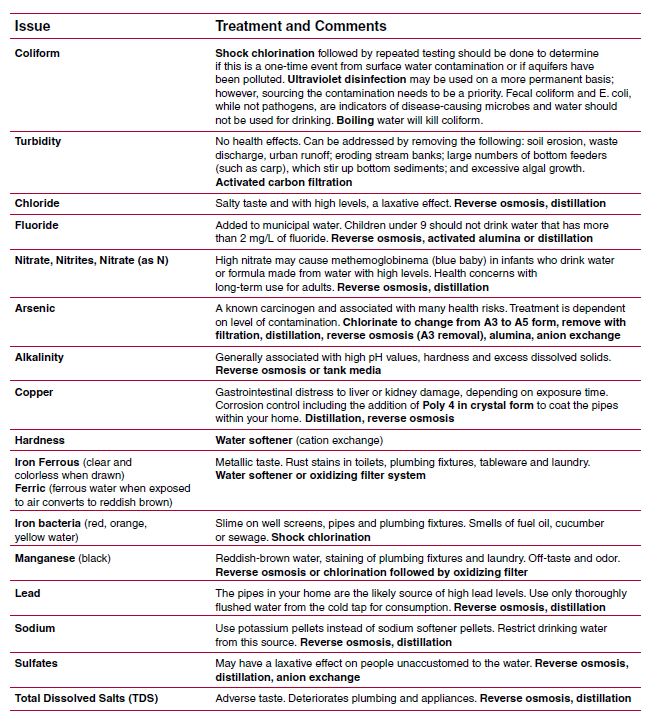 This is a quick guide to problems and solutions in drinking water. Households using municipal or rural water supplies can depend on the utility to follow Environmental Protection Agency (EPA) guidelines for maximum levels of contaminants. An annual report is distributed to the users. Private well owners are not monitored by government agencies. This means the owner must take responsibility for the condition of the system. Routine testing establishes a water-quality record. If a contaminant problem develops, correlating the cause is easier if you keep a water-quality record. Water is never just pure hydrogen and oxygen. Water naturally contains minerals and microorganisms from the rocks, soil and air in which it comes in contact. 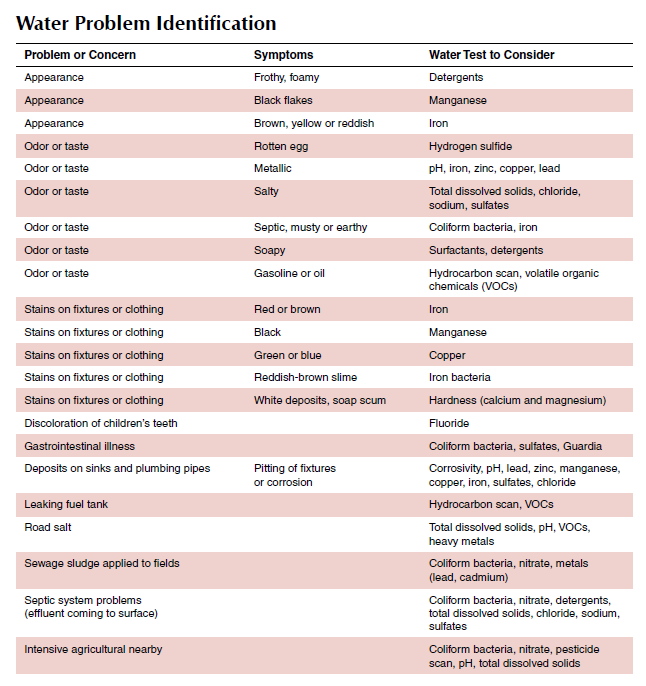 Human activities add many more substances to water. Some, such as bacteria, come from waste products of people and animals. Others, such as gasoline and industrial solvents, are synthetic chemicals, made and used for special purposes. Still other materials, such as nitrate and salt, occur naturally, but human activities can increase their concentrations in the environment. Which of the many potential drinking water contaminants should you be concerned about? Keep copies of ALL results so you can track changes in your water quality through time. Contact a certified lab for questions concerning sampling. A list of certified labs is available. Most labs will provide a sterile collection container with instructions. This container may contain a chlorine inhibitor, so do not rinse the container prior to use. Remove the aerator from the faucet if it has one. Sterilize the end of the faucet with a flame or douse with alcohol. Remove the bottle cap, taking care not to touch the inside of the cap or container. To remove stagnant water from the system, run the water for at least 30 seconds and then fill the bottle to the line indicated or near the top. Immediately replace the bottle cap and secure transportation as soon as possible because coliform samples should be analyzed within 36 hours of collection. Pump the well for several minutes so the actual sample collected is from the groundwater source. Run the tap fully open for 30 seconds before collecting the sample. Rinse the container two to three times with the water being collected unless preservative has been added to the container to maintain sample integrity (iron and manganese). Lead testing requires the water sample to be taken after the water has been sitting undisturbed in pipes. Do not run water prior to sampling. Completely fill the container, leaving a small space for expansion of the liquid. Immediately replace the bottle cap. Send the samples to the lab within 48 hours. 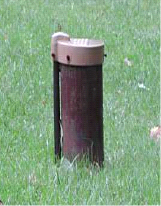 Common well head for a 4-inch diameter casing with submersible pump. Good-quality (potable) drinking water is free from disease-causing organisms, harmful chemical substances and radioactive matter. It tastes good, is aesthetically appealing and is free from objectionable color or odor. This publication was authored by Roxanne Johnson, former water quality associate.